The New Museum has found a new way to bring an oral history collection to life. In their project “Recalling 1993” pedestrians can pick up pay phones throughout Manhattan and be “transported” back to 1993. The oral histories played through the phones are site specific and can even be about the very block that the phone is located on. Speaking of Oral Histories…..The Louie B. Nunn Center for Oral History at the University of Kentucky Libraries and the UK Libraries Division of Library Technologies have created a web-based, system called OHMS (Oral History Metadata Synchonizer) . The OHMS is cost effective and efficiently enhances access to Oral Histories on the web. Also, there is a BLOG called “Visualizing the Past” which features Graphs, Maps, and Trees: Imagining the Future of Public Interfaces to Cultural Heritage Collections. The thing that I love about this is how simple it seems. It’s something that could be replicated in any city, in a variety of ways. It also produces content (the recordings) that can live on after the project is over. It uses what is already there in the community and transforms it, creating a nostalgic experience for those who remember NYC in 1993 (ahem) and those who weren’t in the area or weren’t yet a twinkle in their parents’ eyes. I like to think that even when the installation is over, it will have changed the way the participants view the city. The book focuses on visitor participation in this new age of museums, libraries, art galleries, and cultural institutions. The book acts as a guide basically to working with community members, to ensure that our institutions, proactively aim to be innovative, and remain relevant in today’s society. It also advocates for us, as individuals to participate in this process. The book is not heavy on the technical side, so it is an easy read, and appeals to a larger audience. It recommends different design techniques and also offers results from case studies to create a participatory community amongst individuals, libraries, museums, and archives. 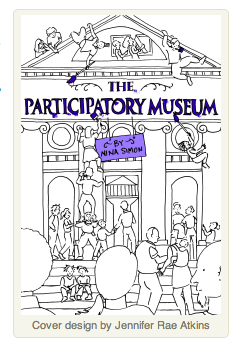 For more info about The Participatory Museum, check out their website here. It uses Encoded Archival Context – Corporate Bodies, Persons, and Families (EAC-CPF) to link relationships among people and related resources or archival collections.